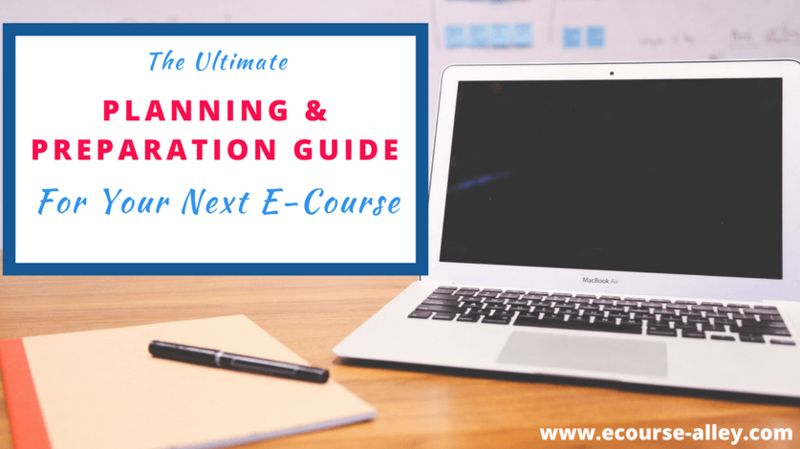 What really goes into planning an e-course? Is it as simple as doing some initial brainstorming, creating a quick outline and banging out content? I wish it were that simple, but there is a lot to think about, especially if this is your first crack at making one. But, the good news is I'm here to lead you down the right path, and I know you've probably heard that before, but I will give you the exact methods that I use. Make sure you don't dive in head first without thinking things through. These methods or strategies or whatever you want to call them help make sure you don't just dive in head first without thinking things through. 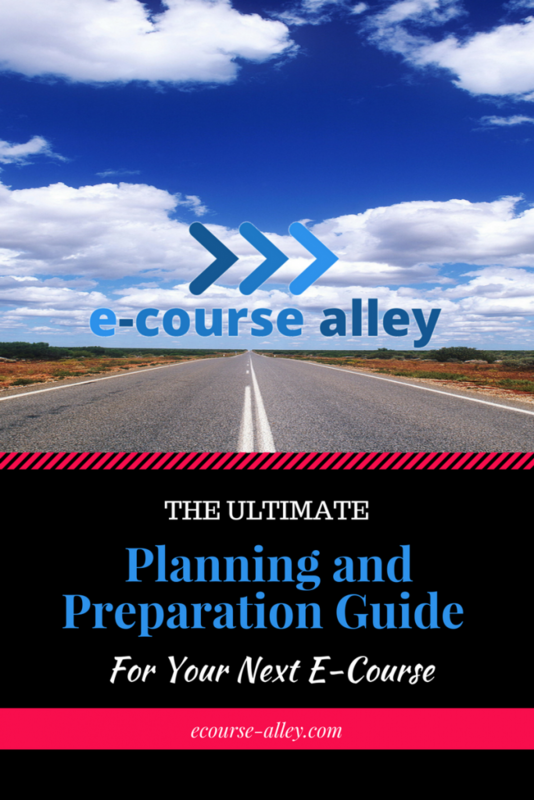 It is an important first step to plan very carefully how you will go about everything connected to your e-course business. There is a lot more that goes into it than just creating amazing content. Read on and I will explain what to do. Okay, so you have an awesome idea for an e-course, but you don't know exactly where to start. I mean, you know basically that you should probably start by creating an outline, which sounds simple enough. But how exactly do you do this effectively, efficiently and with foresight in mind so that you can make sure there will be enough room for your e-course business to grow? Is this all that goes into an initial plan? Organize your content into units/modules and do this at a high level at this stages so that you can plan for follow-on courses in order to avoid overlapping your content. If you have already launched e-courses prior to planning your new course, look at what worked and didn't work well from before and try to improve on your course content, methodology, media, marketing, etc. Have foresight with your initial planning and make sure you think not only about one e-course that you want to produce, but how you can allow for growth (as I mentioned above) with your content and expand upon your niche. Figure out a timeline for producing your course - when do you want to launch it? Estimate this based on how much time you can devote to it per week. The transaction fees associated with a course platform - some may be 50%, some may only be 10% with an option to go down to 0% if you sign up with one of their monthly plans. Marketing - can you do your own marketing or does the platform promote/cross-promote your course(s) and as a result, reduce the price of your course without you having control or are you in charge of how to promote your course(s)? Support available - are you able to easily get help if you run into issues using the software? If the platform has a free plan to start with (a starter plan) and what the upgraded plans cost so that you will have options for when your business grows bigger. Make sure you are comfortable with their payment plans. If you want to use a third party platform at all! If you have a website you may want to run your courses from your own website. There are different plugins you can get in order to manage your courses and enrollments. This is called a Learning Management System (LMS). At this stage in the planning process, I suggest you identify the key ideas to cover in your e-course. Namely what will each unit or module be about? What will the main objectives be? What do you want your learner to be able to do by the end of your course? In other words, use backward design - design your e-course with the end goal in mind. Also, at this time, you should identify any resources or materials you may need to produce the content. What I mean by resources or materials is anything you will need to write the content, create graphics and other forms of multimedia. That is, what software will you need to accomplish your design? You will also have to make sure you have the necessary equipment such as a camera for video recording, a microphone to record audio, good headphones or speakers to help with audio editing, etc. Canva - I use this program extensively to create visuals. It is great in that you can sign up for the free version and you can still do a ton of quality work without having to upgrade right away. With the free version, you are able to access over 8,000 templates, upload your own images, and have 1 GB of storage space. However, the upgraded version allows you to create even more enticing visuals! When you sign up for Canva for Work, you can get access to the upgraded version with their free 30-day trial. This allows you to have the full use of their Brand Kit and you get access to 300,000 free photos and illustrations! You also can create a team (yes a team to help you with your branding and you visuals, how awesome is that?) with an unlimited number of people (on the Free Plan you can have up to 10 people, which is still pretty good), you will have no limit to the number of design folders you can have, your images can be stored in photo folders, and you can resize your images effortlessly. Click here to see a comparison of features for the free and paid versions. Camtasia - Yes, yes I am a PC user, so I will be talking about software like this. It is funny but I haven't see many people who work in the online e-course world who are PC-users, so maybe what I'm going to describe will be helpful for some of you as I found it was hard when I was starting out to discover information to help me since I wasn't a Mac user. However, Camtasia does have a Mac version, although I won't be discussing this version it is there for those of you who are Mac users. Camtasia is great for screen recordings, it has a lot of features that will be of utmost importance for you if you are going to develop e-courses successfully. For example, you can easily edit your videos with their multi-track timeline editing tool, you can add callouts, arrows, shapes etc. to your videos in order to better support your training, you can add voice narration and animations to make your screen recording more engaging, and much, much more. Also, you don't have to purchase this software right away, if you aren't sure you can get their free 30-day trial and try out everything for FREE for 30 days. I would highly recommend this route so that you can test out everything and make sure it is right for you and then at the end of the 30 days if you haven't found it useful, then you haven't spent any money on it. Yeti Microphone - In my opinion this is a must have! This USB microphone is one of the best you can get to record audio directly to your computer. If you are going to seriously get into the e-course business you are going to need one of these to create crystal clear sound. It is designed with four different pattern settings so that you can obtain the best performance for whatever type of audio you want to record, be it voice-overs, podcasts, interviews, etc. The versatility and quality is why I love the Yeti microphone and I highly recommend it for your e-course business. So now that you have figured out all the high level information for your e-course, such as the modules you will cover, the software you will use and the equipment you will need, it is time to get down to the details! First and foremost, you will have to break your modules up into individual lessons. One way to do this is to look at the high level module topic and think about the "steps" that go into leading to the overall goal of the module. These steps can become the basis for your lessons. Then once you identify the lessons for each module, you can either start working on one lesson at a time or think of the lessons as a whole and determine the goals and objectives for each one. I would suggest you first think of the big picture to make sure you don't repeat or overlap with any goals from other lessons. You will also have to think about what multimedia you want to use for each lesson and how you will present the material: video, audio, a combination of video and audio, screen recordings, or face-to-face video of yourself talking to your audience? Something that goes hand in hand with HOW you will present the material is planning out how to make your lesson interactive. What does this mean? Well, it means finding creative ways to engage your audience and help them learn the material better....in other words, how to not make your lessons boring! There are many ways to do this. From my e-learning and instructional design experience, this would mean building interactive buttons that a user could click on (if the lesson was self-paced, meaning the user has control of how they will navigate through the content and at what pace they will go). It could also mean building in videos, audio clips, animations, knowledge check questions or reflections questions, the list goes on. But it's your choice how you want to engage with your audience. The info-graphic below summarizes these points. If you want to learn more, head on over to the Resources page where you can get exclusive FREE tools that will help you follow the right path alleyway to success. If you are really keen to delve deep and learn all the practical tips and secrets to this business of e-course creation, check out the ECA Academy and sign up for Storyboard Your Way to E-Course Success. During this course, from the perspective of an e-learning professional, I guide you through the process of how to best create a blueprint for your e-course so you can establish yourself as an expert in your niche offering valuable, well-organized content to your audience. I have covered quite a bit here, but I hope you have found value in what I have shared with you. Please leave a comment or drop me a line anytime at heather@ecourse-alley.com. Thank you for reading and I hope you will sign up below to become part of the e-course alley community. As a BONUS you will get access to my exclusive ECA FREE Resource Library to help you along your e-course journey. I enjoy this site – its so useful and helpful. Thanks! I’ll be posting more interesting content soon. Thanks! Glad you found it useful. I have a free workbook that will be ready very soon that is available by subscribing to the e-course alley community. Ahaa, its pleasant dialogue regarding this article here at this webpage, I have read all that, so at this time me also commenting here. So glad you enjoyed my post! I will be adding more content soon. This unique blog is no doubt educating as well as amusing. I have found a lot of helpful things out of it. I’d love to go back every once in a while. Thanks! Thank you for stopping by! There is lots more to come. Also, if you want some freebies, check out my Resources page where you can sign up to become part of the e-course alley community and gain access to the ECA Resource Library. I wanted to draft you the little bit of note in order to give thanks again for those fantastic techniques you have documented on this website. It was quite seriously open-handed of you to provide without restraint what a number of us would’ve sold for an e book to help make some cash on their own, particularly considering the fact that you might have done it in case you considered necessary. Those good ideas also worked like a easy way to be sure that other individuals have similar dream really like my own to grasp a whole lot more with respect to this condition. I am certain there are millions of more fun opportunities in the future for those who looked at your blog. Thanks for the kind words! Hope you found it useful, I will be posting more content soon. Magnificent articles, you just gained a new reader. If some one needs expert view about blogging and site-building then i propose him/her to pay a quick visit this website, Keep up the pleasant work. I can’t really help but admire your blog, your blog is so adorable and nice. Exceptional post however I was wanting to know if you could write a little more on this subject? I’d be very grateful if you could elaborate a little bit more. Bless you! Thanks! I’m glad you got some value out of it. What would you like to see more of? I’d be happy to help. We are also in the process of developing an online course that will help you create a storyboard or “blueprint” for your online course design that will boost productivity and efficiency within the realm of e-course creation. If you are interested you can enroll here. Hіghly descriptive post, I enjoyed that a lot. Thanks! Yes there will be a lot more to come. If you want updates on when I post something new, sign up here and you will also gain access to our free resource library in the process! this blog proviԀes quality Ƅased writing. That’s great! I’m glad you found it useful and I hope your friend does too! Can I simply say what a comfort to uncover a person that actually understands what they’re talking about on the net. Exсellent post. I will bbe going through a few of thse issues as well.. Thanks fоr sharing your thoughtѕ about planning. Нi, I lοg onto your blߋg regularly. Your story-telling style is witty, keep it up! I’m extremely impressed with your writing skills and also with the structure for your blog. Anyway keep up the quality writing, it’s uncommon to read a nice blog like this one today. Thanks for your marvelous post! I quite enjoyed reading it, you might be a great author.I will rеmember to bookmark your blog and definitely wilⅼ come back from now on. I want to encourage you to continue your great writing, have a nice evening! Hey! I’m using Siteground actually. I’m very happy with it and I suggest you check it out. There are different plans depending on what you need and I found their yearly costs very reasonable. your useful info. Thanks for the post. I will definitely come back. This is one awesome article post. Thanks Again. Great. Hello! I’ve been following your blog for a while now and finally got the courage to go ahead and give you a shout out from Dallas Tx! Just wanted to tell you to keep up the fantastic work! a lot of things from it about blogging. Thanks. will be tweeting this to my followers! web site who has shared this great article at here.